Summer’s nearly here, it’s Whit week/half term, time to think about a trip to the seaside perhaps? Vintage is much in vogue, but back in the fifties it wasn’t all pretty dresses, handsome curvy cars, and jiving. It was domestic hell from which we ladies had to escape. 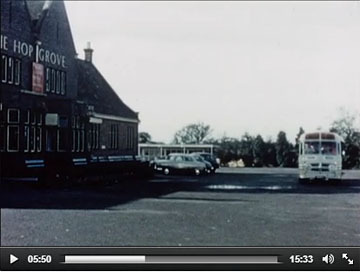 On a Wallace Arnold bus trip, as depicted in this film, another gem from the Yorkshire Film Archive. The ironic commentary extols the joys of being a wife and mother while simultaneously depicting various domestic disasters: broken crockery, baby covered in food, TV breaking down. An interesting, amusing, and in its own way quietly subversive depiction of 1950s ‘domestic bliss’. After you’d folded up all your clean white laundry, which you’d probably just spent the entire week laundering laboriously in the twin tub, hubby would come in with oily hands, drop a bit of car engine on the kitchen table, and rudely shove your laundry out of the way with his big oily mitts. Only one thing to do ladies – jump on a Wallace Arnold bus to Scarborough. Via York. We end up in York at around 5 minutes into the film. We drive up Museum St, towards scaffolding on the Minster (west end, rather than east, back then) and presumably travel via Deangate, as you could then, and then we’re approaching Monk Bar, and then we’re at the Hop Grove, where our beautiful curvy bus pulls up in an almost empty car park. There’s a reference to not having to suffer ‘personal discomfort’, and stops at ‘convenient times and places’, and a shot of a man putting a coin into the palm of a lady. Which I think is indicating, in 1950s style, that they include stops for the toilets. I’ll have to leave you there to continue the journey should you wish, via the Yorkshire Film Archive. The bus travels through Thornton le Dale and on to Scarborough: “Wallace Arnold takes you right in to Scarborough, to their own bus station”. Maybe someone else can tell me what happens. I can’t go to Scarborough as I’ve got too many pages to shepherd into some kind of shape. Thankfully I don’t have put a load of oiled laundry in a twin tub washing machine.